Photography Note: Because of my desire to hike with relative ease across miles of wild country, to wander along ridges and over mountains, to be alive in the wind, I chose to carry a minimum of lightweight camera equipment, primarily a digital SLR - hiking with binoculars over one shoulder, camera over the other. 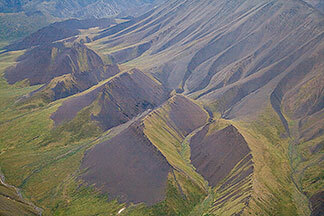 The Brooks Range stretches for over 1000 miles across the northern reaches of Alaska and the Yukon Territory. The highest mountains of the Brooks Range and the area closest to the Arctic Ocean are found in the northeast corner of Alaska. 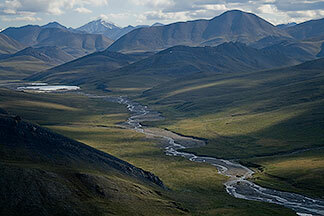 This is the Arctic National Wildlife Refuge. 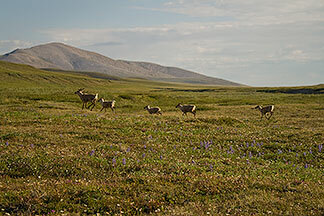 The biological heart of the Arctic Refuge is the Coastal Plain, an area of immense importance to the 100,000 caribou in the Porcupine Caribou Herd. The most threatened portion of the Coastal Plain is the principal calving ground for the caribou herd, the place where female caribou give birth to the next generation and where the herd feasts on the rich forage of the coastal tundra. This is also the densest area for denning polar bears in Alaska and a vital nesting ground for millions of shorebirds and waterfowl. I had traveled in the Brooks Range before, but not in the Arctic Refuge. With great excitement, a good friend and I planned an early summer trip of hiking, backpacking, photography and meditating on wildness. 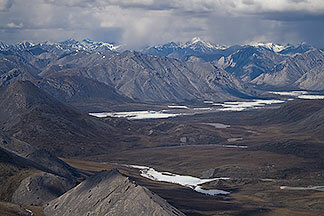 In June of 2008 we were flown over the Brooks Range in a small plane to the northern edge of treeless mountains. We camped at the mouth of a small river west of the Kongakut, looking south to high peaks and north to the Arctic Ocean, a line of ice on the horizon. We were not prepared for the immensity of this part of the Brooks Range or the beauty of the landscape or the frequency of caribou and grizzly bear encounters. Thrilling. The sun never set, but the low midnight light cast a soft eeriness over the land. On rare occasions fog off the ocean would swallow us whole. During our nearly three weeks in the Refuge we counted over 50,000 caribou. For a week they created a braided stream, constantly changing as it flowed across our valley. Pausing to feed or bed down, then moving on, the Porcupine Caribou Herd was traveling through the tundra foothills. Prior to our journey, we knew the long-term protection of the Arctic National Wildlife Refuge and the future of the caribou herd was one of our nation's most important conservation issues. Seeing this land and its abundance was a powerful experience, a joy and a blessing. However, thinking how close to destruction the Coastal Plain has come in past years is enough to bring one to tears. The biologically rich and ecologically indispensable Coastal Plain of the Arctic Refuge also happens to have petroleum deposits, a part of the globally declining source of energy to which our civilization is addicted. The Arctic Refuge is predicted to hold a trivial percentage of world petroleum reserves. At current global rates of oil consumption this oil would be burned up in a few years with virtually no impact on oil prices. Leaving the Arctic Refuge oil in the ground will preclude the release of additional carbon dioxide into the atmosphere, a principal cause of the global warming catastrophe that is rising upon us like a malevolent tide. Also, if we leave the oil in the ground, the inevitable massive development and ecological destruction of the Arctic Refuge that would accompany drilling will be prevented and the Porcupine Caribou Herd saved. When we recover from our oil addiction, which we surely must for the preservation of our economy, our nation and the earth, the Coastal Plain may stand as a monument to our restraint and a testament to the wisdom we finally reached in not despoiling one of the planet’s last wild places.